An industrial strength cleaner that instantly dissolves hard water stains caused by calcium, lime and rust deposits. CLR instantly removes: CALCIUM deposits from glassware, teapots and coffeepots, etc., LIME scales from coffeemakers, kettles, humidifiers, toilets, sinks, tubs, shower stalls, shower curtains, etc., RUST stains from cement, stucco, porcelain, chrome, metal, etc. If your area suffers from hard water problems, then CLR Industrial Strength Household Cleaner is for you. An industrial strength cleaner that instantly dissolves hard water stains caused by calcium, lime and rust deposits. CLR instantly removes: CALCIUM deposits from glassware, teapots and coffeepots, etc. LIME scales from coffeemakers, kettles, humidifiers, toilets, sinks, tubs, shower stalls, shower curtains, etc. RUST stains from cement, stucco, porcelain, chrome, metal, etc. Concrobium Carpet Spot Remover is a revolutionary cleaning solution with degreasing agent that removes the toughest stains and spills with no harmful chemicals. Its high-performance formula removes stains such as food and drink stains, pet stains, grease, pen, marker, crayon, make-up, chewing gum, adhesive and much more. If you're like most people, you're wondering what the best solution is to rid your plumbing & tile surfaces of rust & iron stains. Don't make your visitors head for the door, order Rust Away from Green Gobbler! A revolutionary rust & iron stain remover. Eliminate hard water stains instantly with one mess-free cleaning packet. Simply pour the packet in your tub, toilet or sink and watch rust and iron buildup disappear. No longer will you have to scrub your toilet hard with frustration. You can now lift rust stains easily and do a light scrub to finish it off. 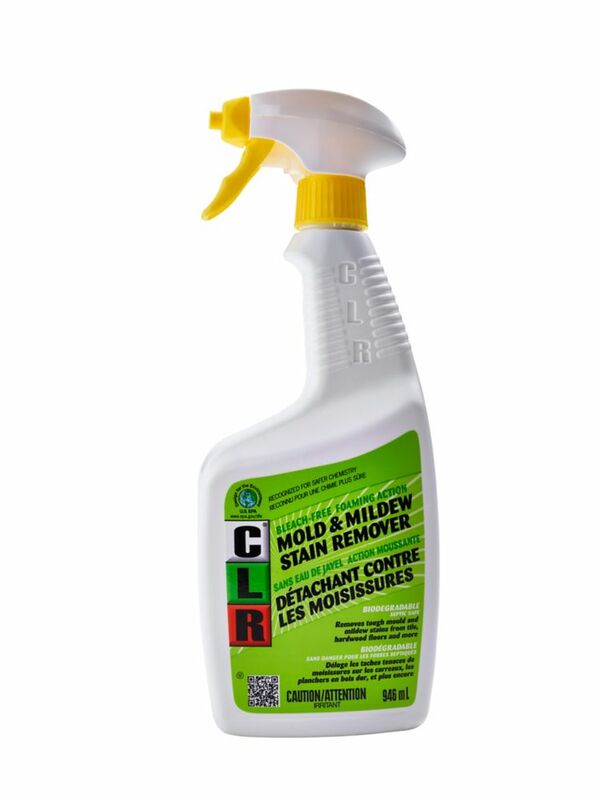 Mold & Mildew Stain Remover CLR MOLD & MILDEW STAIN REMOVER Removes tough mould and mildew stains. Use in bathrooms, kitchens, basements where mould and mildew stains are present. May be used on painted walls, ceramic tile, hardwood floors and baseboards, fabrics, glass, metal, brick, concrete, marble, laminated countertops, fully cured and oil-based painted surfaces, hard plastics, automobile tires, vinyl tops, wood, grout, and fibreglass. DO NOT USE ON STAINLESS STEEL APPLIANCE EXTERIORS. Mold & Mildew Stain Remover is rated 2.9 out of 5 by 87. Rated 5 out of 5 by Broke from This is a great product. This is a great product. Rated 5 out of 5 by Pflash687 from Used this product on mold that was on garage door... Used this product on mold that was on garage door seals. It worked very well! Rated 1 out of 5 by Straz from Purchased this product to remove mold that was forming on the shower ceiling. It was not at all e... Purchased this product to remove mold that was forming on the shower ceiling. It was not at all effective. Not a good value at all! Rated 1 out of 5 by Cat from I was not pleased with product at all. In fact,... I was not pleased with product at all. In fact, I plan on returning it.